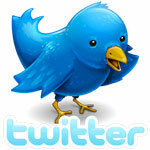 Almost fifty years ago, in 1962, Avis came up with the advertising line “Avis Is Only No. 2, We Try Harder.” Last week, the number two in the cruising world, Royal Caribbean, failed this test by allowing Carnival to try harder while it did nothing, or at least very little. Costa Cruises, in recently announcing that it would add two more decks and some balconies to its Costa Romantica, has joined the ranks of Carnival Cruise Lines and Holland America Line in making alterations to their ships that make them less aesthetically pleasing in order to make more money. And the 200-passenger “Freighter to Paradise” Aranui 3 is to be upgraded this winter. Similarly, Royal Caribbean is number two in the cruise business, and a long shot behind top dog Carnival. But last Sunday, in what must be seen as a significant failure, Royal Caribbean seems to have lost its way when it allowed Carnival to “try harder” when both lines had ships embarking passengers at San Juan. With last week’s impending approach of Hurricane Irene, both lines were put into identical situations but each responded in a totally different manner. The port began to limit traffic and forced both ships to sail early to avoid the storm, which hit San Juan that evening and caused flooding and damage and cut off power to 800,000 homes. Of their 145 stranded customers, about fifteen, who had booked flights with Royal Caribbean, were contacted and accommodated at a hotel in San Juan courtesy of the line. The rest were left to fend for themselves. That same day, only a half hour later, Carnival Cruise Lines’ 2,750-guest Carnival Victory was also forced to depart San Juan, in her case at 6 pm, about four hours early, stranding another 300 passengers at the Puerto Rican port. For those who missed the ship, Carnival provided a complimentary, two-night stay in San Juan and flew those with passports on to Barbados to enjoy the rest of the cruise. Guests who did not have passports, about half of them, could not fly to Barbados and missed the whole cruise. Even so, they were granted a future cruise credit equal to the amount of fare they had paid. Most of these were probably Puerto Ricans as there is now an inconsistency in the rules on passports. Those who fly must have a passport, meaning that anyone who flew into San Juan would have had one, but those who travel only by ship can still travel without one if they have a passport card, enhanced driver’s license or enhanced identity card. This accounts for the peculiar statistic from the Cruise Lines International Association, that 81% of American cruisers have a passport while only 51% of non-cruisers do. But back to the case in hand, both lines learned early on Sunday afternoon that harbour traffic would be limited and both planned an early departure, Royal Caribbean three hours early and Carnival four hours early. While Carnival offered rooms to all their customers, Royal Caribbean decided to accommodate only those who had purchased airfare through the cruise line, expecting the other 130 to find their own hotels and pay for their own air fare to join the ship in Aruba. In view of the circumstances and the caring action taken by Carnival, not to mention the fact that airlines were waiving change fees caused by the hurricane, Royal Caribbean come away looking about as bad as they could. For a line that has been garnering so much favourable public reaction in the past couple of years, even if it was a weather-related event and it can be argued that the intending passengers should pay and fall back on their insurance, this does seem like a wrong decision on their part. Later in the week, both ships made history when they arrived together in St Kitts on Friday, bringing several thousands of passengers to ride the St Kitts railway and go on local tours, an unusual occurrence in the summer time. And the chairmen of the two respective corporations? While Carnival’s Micky Arison joined the world of Twitter on August 11 and now has almost 20,000 followers, Royal Caribbean’s Richard Fain was reported acquiring another $1.5 million in Royal Caribbean stock. With the news that Costa Cruises will be adding two decks and balconies to the Costa Romantica in a €90 million rebuild, another ship will lose her good looks for the sake of a few more balcony cabins that can be sold for a higher fare. Costa will join the ranks of Carnival Cruise Lines and Holland America Line in detracting from the appearance of their own ships to make them more profitable. And the reason for this is that most of these ships have been built along the old style of having their lifeboats installed on a high-up boat deck in the style of the traditional ocean liner. When Costa, added balconies to its Costa Victoria, a newer ship, she had a lower Canberra-style boat deck, nearer to the main deck level as opposed to higher up. (In 1961, P&O’s Canberra became the first major liner to have her lifeboats installed at this level). This effectively meant that “clip on” balconies could be added to the Costa Victoria at levels above the lifeboats without affecting their operation in any way. The same was true of Celebrity Century and her near sister ships Mein Schiff and Mein Schiff 2, ex-Celebrity Galaxy and Celebrity Mercury. These alterations have all been aesthetically pleasing and in fact could be said to have improved the appearance of the ships involved. But Carnival Corp & PLC has the problem that many of their ships are of an older design that is not easy to convert. Carnival’s eight Fantasy class ships and the Costa Classica and Costa Romantica were all built in the old style, with lifeboats atop ship like the original Queen Mary. The only spots where clip on balconies can be added is in areas of the hull where there are no lifeboats installed above. Thus we have the Fantasy class, now in the course of conversions that will add 98 balconies to each ship. Many of the new balconies are around the stern of the ship and in particular areas, such as amidships, where there are no boats above. 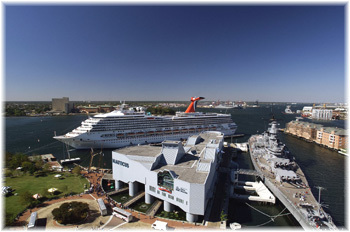 The first ship to be thus converted was the Carnival Sensation, in January 2009. Because of this, only 24 new balconies could be added amidships (plus extensions to twelve existing balcony cabins) where there were no boats, but another 74 were installed at the aft end, clear of the lifeboats. This has lead to an appearance totally different from all other balcony conversions to date, but will almost triple these ships’ balcony cabin inventory from the existing 54. In fact, once the same is done with all eight Fantasy class ships, Carnival will have added 784 new balconies to its fleet, but at what cost? Late last month in Key West, two of the unconverted Fantasy class ships, Fantasy and Imagination, managed to strike stern-to-stern. Luckily, neither ship has yet received the 74 stern-end balcony cabins or someone might have been hurt. Meanwhile, Holland America’s four Statendam class ships and near-sisters Amsterdam and Rotterdam do have lower lifeboat decks, but spaces above these boats had already been given over to as many balcony cabins as possible, they had to do something else. Carnival designers came up with a way to clip half a dozen balconies on to each side of Holland America’s Statendam and Rotterdam class ships at the forward end of the superstructure. The first ship to receive this treatment was the Veendam, which was fitted with extended stern accommodations as well as her new clip-ons in 2009. To show just how valuable these balconies are, the Veendam’s bridge wings had to be extended so her officers could see around the new balconies. Installing sliding doorways into cabins that are located along the promenade decks also created new so-called “Lanai” cabins. Holland America ships are also receiving new balcony cabins in new accommodation blocks being added aft. 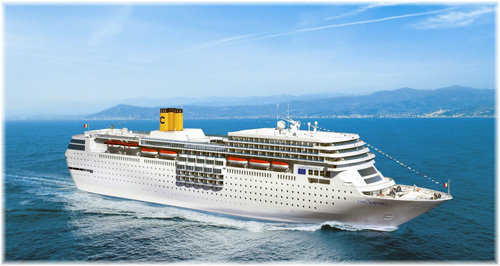 In the case of the Costa Romantica, Costa will add two decks above the bridge and, seemingly influenced by Carnival Corporate Shipbuilding, will add three decks of clip-on balconies on each side amidships where there are no lifeboats. Another fifteen balconies will be clipped on below five existing balconies on each side of the ship, adding thirty clip-ons and of course there will be balconies in the two new decks above. Her passenger capacity will be raised from 1,697 passengers to 1,800 and her balcony count rise from ten to 86. As part of the transformation, windows with a view will be added in the forward part of the superstructure but it seems these may be dedicated to the Samsara Spa, a wellness area with gym, thalassotherapy pool, treatment rooms, sauna and Turkish bath. There will also be fifty Samsara Spa cabins and six spa suites as well as a restaurant for passengers in Samsara accommodations. A new wine bar will offer 100 labels and a selection of cheeses from around the world, while a coffee bar will serve sweets. A new show lounge bar with a dance floor and cabaret and a nightclub are also included in the plans. Almost as if in apology for the exterior changes, the interiors will be the work of Tillberg Design of Sweden and Syntax of London, “with a view to giving the ship an elegant, sophisticated and refined atmosphere.” This is a change for Costa as Joe Farcus has been doing their recent ships. The result, the “new” ship, to be renamed Costa NeoRomantica, will be a somewhat top-heavy looking vessel with balcony saddlebags amidships. She will no longer be one of the best-looking classical cruise ships afloat – nowhere near in fact. The San Giorgio shipyard in Genoa, a subsidiary of T Marriotti, has been charged with the work, which begins in October, and in February 2012 she will re-enter service on 11-night cruises to the Canary Islands. It is to be presumed that the Costa Classica may be similarly converted in time. The Aranui 3 was the first of the cargo-passenger vessels bearing the Aranui name that was really built with passenger comfort in mind. The well-appointed “Freighter to Paradise” will soon be receiving further enhancements including new carpeting for guest cabins, as well as new and re-upholstered dining room chairs, among other things. During her 2011/2012 winter dry-docking, her main engine will also receive an overhaul, while her hull will be scraped and repainted. Lifeboats will also receive a major overhaul. 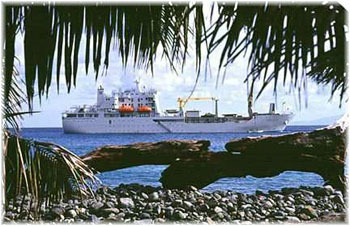 The Aranui 3 is a mixed passenger-cargo vessel operating between Tahiti and the Marquesas, offering comfortable, air-conditioned accommodation for about two hundred passengers. The ship features sixty-three standard cabins, nine deluxe staterooms and fourteen private balcony suites. 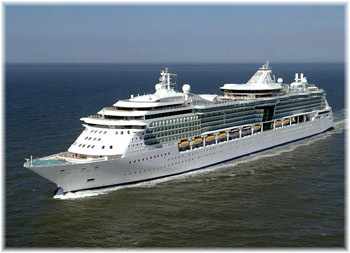 Her 2012 schedule will include sixteen departures from February 4 to December 15, 2012. She departs from Papéeté, Tahiti, on a regularly scheduled 14-day voyage. She sails every three weeks, with a week between voyages to load and unload. Travellers on the Aranui 3 receive a complete holiday experience, following in the footsteps of such famous figures as Treasure Island-author Robert Louis Stevenson. Guests journey through 800 miles of the most spectacular and remote islands in exotic French Polynesia including Tahiti, the Tuamotu Islands and Marquesas Islands. Featuring a crew primarily composed of local inhabitants from French Polynesia and the Marquesas Islands, the Aranui 3 combines world-class hospitality with top-notch amenities and stunning scenery for an unforgettable sailing experience. Fares for 2012 start at £3,175 (€3511) per person sharing a standard twin bedded outside cabin with private facilities including all meals with wine, all land-based guided sightseeing excursions, picnic and meals ashore, plus taxes. Optional excursions such as scuba diving, horseback riding, fishing and helicopter tours are additional. The operator reserves the right to charge a nominal fuel surcharge. Flights to/from Papéeté, Tahiti, are not included in these prices. Air France and Air Tahiti Nui fly to Papéeté (via Paris and Los Angeles), with prices from around £1,750 pp return.